Friday afternoon. Finished work, so I’m out for a spin on my local buses. I caught National Express West Midlands service 222, which runs between the much mimicked “Dud-lay” and the much-maligned (in traffic terms) “Merry Hell” (Merry Hill, to give it its correct term – a giant shopping centre in the Black Country that seems to suffer from an overly fair share of gridlock and less than gifted motorists). I’ve caught this route a million times (probably), but today got me contemplating. The 222 is one of those suburban bus routes, which are replicated all over the country. Trundles around a few estates, serves the local hospital, and ends up at the shops. It was born back in the 90s when West Midlands Travel decided to tidy up the myriad routes serving Russells Hall estate. The locals had a choice of goodness knows how many alternatives. Some running up this road, some down that. Convenient for some, maybe, but desperately confusing for non-regulars. So one simple direct route was created. Cue howls of derision from some. But many years later, it’s a good performer and simple to understand. As frequent as every 10 minutes, it has been trimmed in recent times to every 15 minutes today. So why the contemplation? In most recent times, the route has received smart new branded Enviro 200 single deckers, with audio and visual announcements, with a suitable female voice containing just a hint of that classic Black Country accent. The route isn’t one to receive a huge fanfare – but it pleases me to see it doing what so many unsung bus routes do well – perform solidly. The route isn’t without its problems. Merry Hill and it’s traffic is a regular issue. Errant parking around the Hospital adds to operational challenges (and probably led to the most recent decision to lower the frequency from 12 to 15 minutes – you see much less bunching these days). The 222 doesn’t have high profile vehicles with Stenning-designed liveries or applications to win UK Bus Awards categories, but it’s a good honest route, with good honest staff providing good honest service. Away from the bright lights of leading UK bus routes, the 222 does what so many others do. Serve it’s community well. You may think that this is some evil fog descending on the people of Brierley Hill. 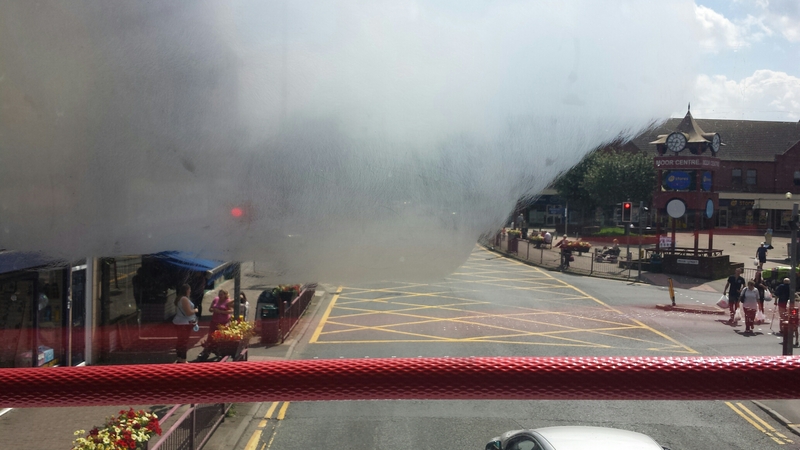 Actually, it is my view from the upper deck of a National Express West Midlands double decker on the 246. Apparently the result of some continuous rubbing of the glass, it isn’t pretty. Whether the result of some over-excited youth who clearly needs to channel his efforts into something more productive, or the honest attempts of garage staff to remove some previous damage, it is unclear. Unclear is also my view of the road ahead…. 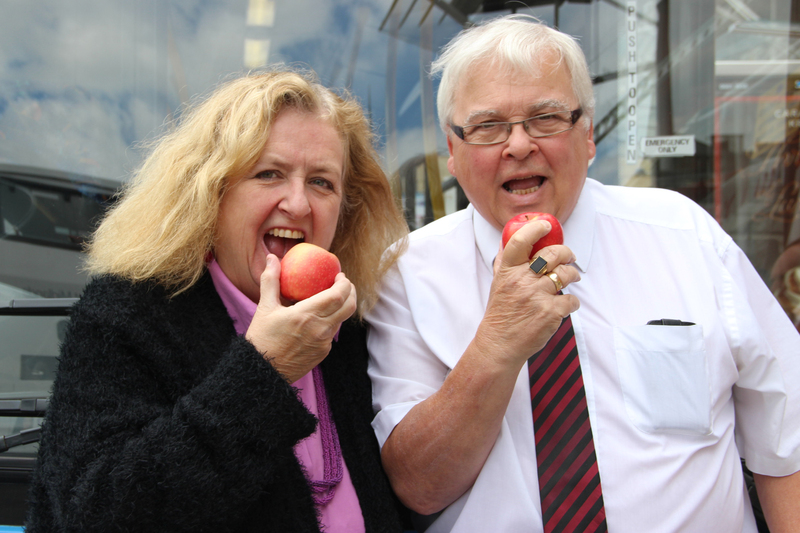 Much ado about the cost of bus fares in recent weeks. First have cut some of theirs and others are trying deals to woo new passengers onto their routes. I’m currently squashed onto Hansons 004 service from Merry Hill to Harborne. Buggies, trollies, walking frames and plenty of standees. A rip – roaring success for the operator, yes? Well, to the almost orchestral sound of pass-bleeping, I’m one of only 2 or 3 who isn’t riding this bus with a concessionary pass. The scheme -socially – is a great thing. It gives holders freedom to get about and be part of society. It’s what a civilised nation should do. But of course, it costs. Are bus operators getting a decent payment for carrying these “free riders”? That of course varies from area to area. Politically, it’s here to stay. Imagine the grey vote’s uproar if it were suggested that it were somehow reduced or removed. It would probably rival the Iraq war demonstrations. And nor should we countenance it. But where politics is involved, it’ll always be a struggle for operators to feel good about the payments they get. And us fare-payers often feel the brunt of such arrangements as bus companies try to make ends meet. The concessionary pass is a good thing and long may it reign. But the struggle – as always – is to make the politicians see the great worth in it. Clutching a grab pole as my bus approached its stop, scrutinising of the cab to see what running board my bus is on (yes, I know), my attention deviated to a sign just below the drivers perspexed window. It referred in some form of words I can’t recall exactly to how drivers had the right to work without fear of attack or intimidation and how the company would actively seek to prosecute anyone who didn’t respect this right. It was also positioned to be read ahead of any cuddly “Welcome Aboard” notice (which comes further down the driver’s cab door). Although I understand it, I’m rather saddened by this, and I doubt it has any effect on the entirely honourable intentions it sets out to achieve. I also work in public transport, on the front line, at the “coal-face”, and I’m very happy serving the public. But – as any public transport worker will identify – it has its moments. There probably isn’t a bus driver, train guard, or ticket inspector who hasn’t been threatened or treated in an appalling manner at some point in their job. It isn’t pleasant, and, as the sign intimates, everyone deserves to work without fear of this sort of unpleasantness. So why does the sign sadden me? Well, apart from the very negative connotations it serves up (“expect trouble on this bus, dear passenger”) I don’t think it’s actually necessary. It ought to be in the understanding of the bleeding obvious, for a start. Secondly, are we seriously to believe that someone intent on threatening a bus driver is going to take the time to stand and read such a notice in the first place, then decide that it perhaps isn’t a good idea after all? There has been plenty of debate regarding Perspex screens to protect bus drivers, or whether it is better to have face to face contact with them. I’m not bothered either way, and I understand why they are there – especially for routes operating in certain areas, I’m very sad to say. That is the raw truth – some staff need protection in areas where risk of assault is higher. It is a similar argument to the call to “bring back bus conductors” – would they simply be a target for the kinds of yobs that have brought the need for Perspex screens in the first place? We all want to feel safe on our buses, and perception is a lot worse than reality – the overwhelming majority of bus journeys pass without incident. In the West Midlands, the award-winning “Safer Travel Team” has been a success story. It has helped significantly to root out trouble on buses and deserves a lot of credit for doing so. 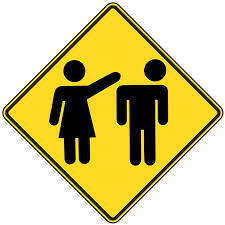 But I’d rather not see signs that smack of political correctness. Do we really have to formally warn some less than pleasant individual in advance that, should he or she feel the need to abuse or attack a bus driver for simply doing their job, herein lies a possible consequence of their actions? I see the thought process behind such warnings, but if that’s the first thing you see upon boarding a bus, wouldn’t you be thinking of driving lessons? 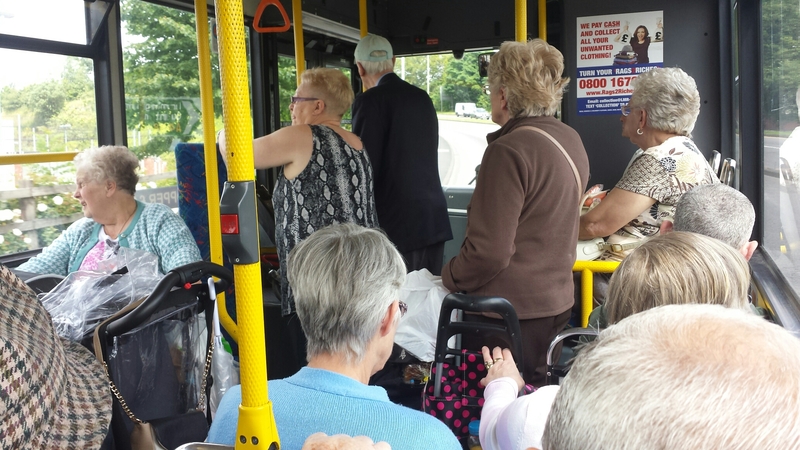 Half to the Market – can Buses Reinvigorate Retail? If you believe the geeks, we’re all clicking away on our mouse shopping in cyberspace. Weekly shop from Tesco, that nice Victorian lucky rabbits foot from eBay, a discounted book from Amazon, and maybe spruce up your wardrobe from countless mail order websites. The High Street is dying on its feet, blighted by a million betting shops, pound stores and charity outlets. Mary Portas suggested salvation in free car parks. Eric Pickles invited all and sundry to park where they like and beggar the consequences. No one (or, actually, not many of us) suggested the bus. Hell fire. Isn’t the bus that big lumbering thing that uses up valuable road space which could be far better served squeezing more cars in? Greener Journeys are one of the very few to even suggest the bleeding obvious. Buses carry lots and lots of people. They all arrive brimming with shoppers in the town centre, and they all leave, virtually all having bought something. Everyone sees cars. No one sees bus passengers. Buses have a price problem. Unless you’re a regular who buys a pass (or one of the lucky ones who has a concessionary pass! ), you’re parting with real money every time you get on. And that is painful. Then there’s the price. Some may baulk at, say a £3.80 bus fare, but not think twice about filling up the car for £50. Every journey thereafter is “free”. Smartcards like Oyster help here. Of course you’re still “paying”, but it doesn’t feel like it. Think about special offers in shops. Everyone loves a bargain. You might not think twice about a chocolate eclair. But if it’s half price, on “special offer”, the evaluation begins. There is no doubt this “psychology” is being studied deeply in the boardrooms of retail outlets everywhere. Yet “special offers” on buses – meaningful special offers – are sometimes thin on the ground. Bus operators’ “special offers” are often bound up in day tickets, or longer-period ones. Think of National Express West Midlands £4 DaySaver. Excellent value for such a large network, but it doesn’t grab you like a cheap chocolate eclair does! “If the fares were cheaper, I’d use the buses more”, claim some. But the threshold for this tipping point is surely personal to all individuals. How “cheap” does a bus fare have to become to persuade a current non-user to become a user? First picked up on this at several of its operations in recent times. They’ve had some success in dropping fares in certain areas, but my hunch is that many of these locations had high-priced bus fares to begin with. But of course, “high-priced” in my own personal opinion! That King amongst operators Trent Barton also caught my eye. “Free Ride Sunday” is the sort of “chocolate eclair” offer the bus industry needs. “Free bus rides for all” in January the promotional blurb screamed. Is there a catch? Of course, if you are cynically minded. Most Trent Barton journeys (apart from a few services) were indeed free, but only for one hour, 10am-11am, on Sundays in January. The idea being that it would attract people out to the shops. Of course most would also have to get back home later, when normal fares applied. So the offer amounted effectively to a “half price” deal. But nonetheless, “free” catches the eye. And ultimately it was win-win for everyone – passenger gets good travel deal, bus operator attracts more patronage at what is a quiet time, and shops hopefully get more visitors spending. Add in the lack of motoring stress, cash to park – even if you can find a space – and you’ve found a bus-based winner. Now I’m not saying every bus operator everywhere can do this and scoop the benefits. It won’t work everywhere. But I love its simplicity and its ability to demonstrate the humble bus can play a real, effective part in the revival of the High Street. Now Birmingham is in on the act. Not in a huge way though. Day tickets in the West Midlands are already good value, but a small independent, running a Centro-subsidised service, has had that “moment” where an eye-catching fare deal could really make a difference. West Midlands Special Needs Transport” – or WMSNT, to give it its more “snappy” title – runs the 10H. The route has been abandoned commercially more times than Robinson Crusoe, and was left to wither as a Centro contract. Who actively promotes tendered services? They’re unloved, by the virtue no one wants to operate them commercially. They end up being based on the amount of concessionary pass use, and anything paid in cash is a bonus. The Authority has no budget to promote them and the operator is only there because they’re usually the cheapest. So three cheers to WMSNT and to Kath Hartley, Councillor and Vice Chair of Centro (and a dedicated “fan” of buses) who have got their heads together to try a special offer that does make your head turn. Every Saturday in June, Adults will only have to pay a childs off-peak fare (60p) rather than the standard £2.10, saving £1.50 or £3.00 for a round trip. 2 Adults and 2 Children can do this trip for a total of £4.80 there and back, rather than the normal £12.60. Why am I waxing lyrical about all of this? Because it deserves to succeed on several levels. – the 10H is a route that I’ve always thought had potential. 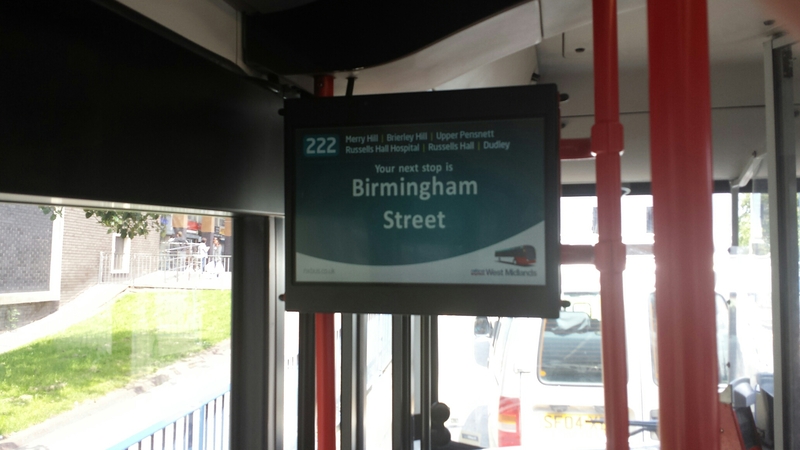 By routing it around by the Birmingham Markets, it opens up a newly accessible area for the route’s passengers. – the special offer fares catch your eye. If you’re a low income family struggling to make ends meet, who wouldn’t be tempted by such an offer? – the Birmingham Markets have been in decline for a while. Anything to boost them is welcome. – the 10H similarly is a route that has suffered long-term decline. If more fare-paying passengers can help boost the viability of the service, it’s great news. – it again demonstrates that the bus industry can play a significant part in the revival of the High Street’s fortunes. This sort of thing can’t be done everywhere, but where the risk can be taken, it is very much welcomed.